In this article , we will look at how to create Java applications on EPOC-based devices. We will build a Java application that accesses a database of contact information and deploy and test the application on a Nokia-based emulator. To run the sample application, you’ll need the Nokia 9200 Communicator Series SDK for Symbian OS . This article assumes that you are familiar with Java Swing programming, and gives you a brief introduction to the JavaPhone 1.0 APIs, which give Java programs access to a selection of native services on the phone used by our application. Java Telephony API: Allows Java programs to create and terminate outgoing calls, listen for and answer incoming calls, and detect changes in the call state. Calendar and Address Book API: Allows Java programs to read, write, and modify contact details, calendar items, and to-do items, working transparently with data in native Symbian format. We will be using the contact book APIs to store and retrieve our application information. javax.comm : Allows Java programs to discover, configure, send, and receive data on available ports (serial and infrared). P2P Wireless Datagram API: Allows Java programs to exchange datagrams with other devices via UDP or SMS. We can test the application we develop here on an emulator before deploying it to an actual device. As noted, we will be using the Nokia 9200 Series Symbian OS SDK (Java edition), which can be downloaded from the Forum Nokia Web site . The SDK includes an emulator, the PersonalJava application environment, tools, and utilities to deploy and run the applications. Write the Java code in your favorite editor. Compile the code to Java class files. Test under the WINS emulator (this requires a PC running Windows 95/98/NT/2000). Copy the class, .txt, and .aif files to the target machine. The class files do not have to be recompiled. Test your application on the device. Create an SIS installation file for easy deployment of your application. As our application relies on the Java Phone APIs for storing data in Symbian format, we’ll look at some of them, namely javax.pim.addressbook and javax.pim.database, before going into the details of our code. Using these APIs, we can store and retrieve our contact information. The ContactDatabase class is an abstraction modeling a database storing contact information. ContactDatabase implements the javax.pim.database.Database interface and stores information associated with contacts. This information is organized in the form of Items. A ContactCard, which stores information about an individual contact, is a subclass of Item that can be retrieved from the ContactDatabase. To open the contact database, we can use the static method ContactDatabase.openDatabase(). After we’ve opened the database, we can manipulate it. Each row of a database corresponds to a ContactCard object. 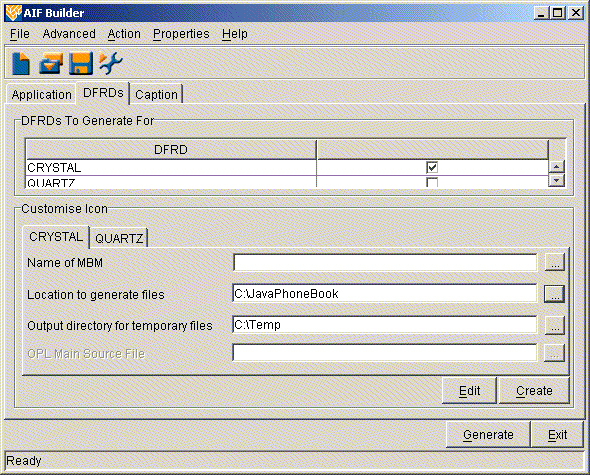 This object stores details of a contact in ItemFields, which can be aggregated further to produce AggregateFields. The ContactDatabase class has static final fields that correspond to the name and value fields (and parameter name and parameter value fields) of the vCard specification . If a field in the vCard specification has property named N, then the ContactDatabase will contain a static String field called N. The ItemFields of ContactCard map to these fields. Hence, the ContactCard equivalent field to the vCar property named N will be a static String field ContactDatabase.N. These specify name, formatted name, telephone number, and structured delivery address, respectively. A field such as ContactDatabase.N can be an aggregate composed of up to five parts, as follows, where the integer represents the index of the respective component part. is the index in the N field of the given name (and has the value 1). Some example values are given below in Listing 4. These indicate home and work addresses, respectively. We will be using the above fields while building our Java phone book application. With this information under our belts, we now have sufficient knowledge to build and run our sample application. Download the sample.zip file. This file contains the javaphonebook directory; extract it to your C: directory. The javaphonebook directory contains the JavaPhoneBook.java application. This application represents a phone book, which stores contact information using the Java Phone APIs we discussed in the previous section. Let’s analyze the code in JavaPhoneBook.java in some detail, starting with line 40. Because Nokia 9200 Series communicators do not, by default, have a pointer, the user interacts with applications via the keyboard, also known as the Command Button Array (CBA). Hence the JavaPhoneBook extends CFrame with implements CBAListener so that user interaction takes place through CBActionEvents. The CBA responds to CBActionEvents and hence the CFrame (which extends the Frame class) implements a CBAListener interface, which in turn extends the EventListener interface. Lines 43 to 47 define the TextFields for user inputs firstname, lastname, workph, address, and homeph. Line 54 creates an instance of the CBAHandler; lines 56 to 58 create a new CBA for add, find, and close operations. In lines 60 to 62, we declare variables for accessing the ContactDatabase, ContactCard, and Iterator to iterate over ContactCards. private Iterator results; // Used to iterate through the search results. Lines 71 to 90 build the UI part of the application. Lines 98 to 107 create ActionListeners for menu events and handlers to catch CBA events. Line 113 calls the openDataBase() function that opens the contact address database. Lines 126 to 146 react to user actions, calling the add, find, and close functions, as appropriate. If the action is add, for instance, the createRecord() function is executed. This function creates an AggregateField (as discussed earlier) to store user-entered names and addresses, and an ItemField to store work and home phone numbers in the form of name-value pairs. Next, lines 215 to 233 create a ContactCard, as shown in Listing 17 below, to store the fields we created above. We then add that ContactCard to the contact database. Thus, our ContactCard holds the AggregrateField and ItemFields. In this way, a record (in the form of a ContactCard) is inserted into the ContactDatabase. Lines 247 to 289 get the ContactCard and retrieve the values associated with it. First we use the getField(“N”) method of the ContactCard APIs to retrieve the AggregateField consisting of names; then we retrieve the values of the first and last name from the AggregateField object. We follow the same procedure for the remaining fields and display their values in the appropriate fields in our user interface. Now that we’ve taken a look at the high points of our application’s code, let’s see how to build it so you can experiment with it on your own. Run the buildPhone.bat file that compiles the JavaPhoneBook.java file and creates JavaPhoneBook.jar in that same directory. buildPhone.bat assumes that the %epocroot% variable has been set; this generally happens during installation of the Symbian Nokia SDK. %epocroot% points to C:\Symbian\6.0\NokiaJava\erj, where C:\Symbian\ is the directory where you have installed the SDK. Next, we shall create the classes that need to be deployed to the Symbian Environment on the Nokia emulator. Version 6.0 of the Symbian platform is delivered as two complete communicator reference designs (aka DRFDs): Quartz, for pocket-sized, palmtop devices, and Crystal, for powerful, keyboard-based, wireless information devices. Each device family has a shell program — Extras on Crystal, and the Launcher on Quartz — that allows the user to run application programs. Quartz is a tablet communicator with convenient pocket-sized, palmtop form factor. An EPOC application file (.app), which, at minimum, contains a unique identifier (UID) to identify the program. An application information file (.aif) to specify the icon and caption that will represent the phone on a menu screen. Other files might also be required, depending on the programming language of the application. For example, a Java program needs an additional text file (.txt) to specify the correct command line to the JVM when the application is launched. AIF Builder is an application that runs on your development machine (not the device or the emulator) to help you easily create the required files. It works with several device families and programming languages. Open the AIF Tool Builder from Program Files -> Symbian 6.0SDK -> Development Tools. Select New from the File menu, and select Java as the application language in the Application Details pane, as shown in Figure 1. Type in JavaPhoneBook in the Application Name field. For Application UID, type in 0x01000000, which uniquely identifies the application. Each application must have its own UID. A UID is a 32-bit number, which you can get as you need from Symbian . During development, you can choose temporary UIDs within the range from 0x01000000 to 0x0fffffff. Care must still be taken to ensure that no two programs have the same UID; such a conflict could stop a program from loading correctly, typically leading to NotFound errors. 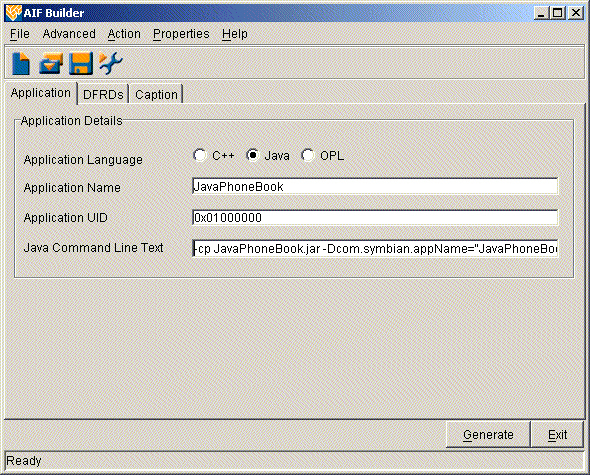 This tells the JVM on the emulator or device to run the appropriate class file for the JavaPhoneBook application. Next, select the DRFD’s pane (see Figure 2) to select the device family or families for which the application is written. In the DRFD’s To Generate For option list, check only the box next to Crystal, as we are developing for Crystal-based devices. In the Location to Generate Files field, select the directory where you have the JavaPhoneBook.jar file and the files extracted from sample.zip; you can use any existing folder as the output directory for temporary files. Click on the Generate button and four files will be created: JavaPhoneBok.aif, JavaPhoneBok.app, JavaPhoneBok.txt, and a temporary file named JavaPhoneBook.rss. Click on Open and the screen in Figure 4 appears. Enter the information requested and select Add Information, which is nothing but a CBA button that fires the appropriate createRecord() method. The information is added to the ContactDatabase. You could also add information from the menu section. Press the F1 key on your keyboard to access the drop-down menus. Select Main Menu -> Add Information as shown in Figure 5. This menu event corresponds to the menu events that we have programmed. Select Clear Fields from the Main Menu to clear all the information. Then type in the last name of the person for whom you want to search and click Find Information as shown in Figure 6. You should see the data being populated in the remaining fields if the last name is found in the ContactDatabase, as shown in Figure 7. Thus, we have successfully built our phone book application. To deploy our application to a real Symbian OS device, we must create a Symbian installation (SIS) for it. The SDK includes the necessary tool for this, an executable named makesis.exe. This tool needs a .pkg (package) file as input that contains the application information and files that need to be deployed. Refer to the Symbian developers’ Web site to learn how to create an SIS file for any application. We’ve now built a sample Java-based application on the Symbian platform and deployed and tested it on our Nokia emulator. This application build can be transferred on to our actual Nokia 9200 series devices. You should now be able to use your existing Java background and your new knowledge of the Java Phone APIs to start developing applications for this useful class of devices. Now you need to put your creativity to work and think about what kind of apps Symbian users need! This article of mine was first published by IBM DeveloperWorks . All rights reserved by IBM and author.